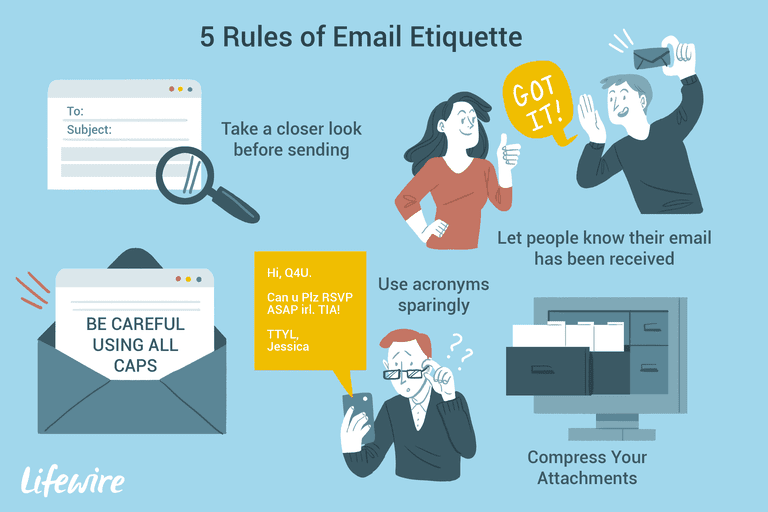 These core rules of email etiquette help us all communicate better via email, and it pays to know them. Pause a moment after you complete an email. Look at the recipient(s) names. Only then should you choose Send. An ounce of prevention is worth a pound of cure. In Gmail and a few other email services, you can enable an unsend feature that gives you a couple of seconds to undo potential damage even after sending an errant email. Where this is not available, try leaving the To field blank or entering your own email address, so you are reminded to take a final look before sending. If "Reply" is good, then "Reply to All" must be better. Is that right, though? Be mindful of the recipients' inboxes and don't send your reply to people who don't need it. Don't intimidate recipients with too much text. Compose a short and easy-to-grasp message instead. Do you think quoting original text in your email replies is a lot of work? It isn't. Sometimes, it is important for continuity. Your recipient may not know what you are replying to, but if you quote the portion of the sender's message in your reply, your intent is clear. In most cases, you can copy the part of the sender's email and then select "Paste as quotation" (or similar verbiage) in your reply. If the sender's message was long, you don't usually need to quote the entire thing. Do you make silly errors in your email subjects? The key to getting your messages read, it turns out, is not to be clever. Instead, focus on giving the message's bottom line or summarize the message. Don't be wordy and leave out unnecessary words. If you want the recipient to take an action, say so in the subject line. Forwarding emails is a great way of sharing ideas, but make sure the original idea is not lost in obfuscation. It is perfectly fine to use a heavy hand in editing out parts of email chains that don't apply to the forwarding recipient — as long as the deleted parts don't change the intent of the message. Not everybody can receive your formatted emails. Some may even be annoyed. To be safe rather than sorry, so send plain text emails when in doubt. This is particularly important in a business setting, where time may be limited. You're probably suspicious when you see a too-astonishing-to-be-true email hoax in your inbox. Don't make the mistake of forwarding by email any story you have not investigated yourself and confirmed to be true. Make sure you are not spreading worms and viruses via email or act as a vehicle for spreading spam. All of this can be caused by malicious emails. Fortunately, there's protection: Use anti-virus software, keep it up to date, and scan individual files for free. Better communication makes better relationships. To forward emails and links in a way that shares relevant information and fosters ties, spell out at the email's top, why you think the recipient will find the information you share interesting. Span filters are welcome additions to email services, but they aren't perfect. Occasionally, they'll nab an important email. Spare others this nagging concern and let them know you got their email. Do not clog email systems by sending huge attachments or do it only with permission. Make the world less confusing. Try to talk about one subject per message only. For another subject, start a new email. Comma, colon, hyphen, and semicolon — all exist for a reason: They make it easier to understand the intended meaning of a sentence. Don't make life more difficult and possibly less interesting for the recipients of your emails. Pay attention to punctuation. DYK? Not everybody knows every acronym, and these abbreviations do not save that much time anyway. So, use few if any acronyms, and only if you are sure the recipient knows their meaning. It's rude to make someone run a search on something in your email. When your photos look good in your email, you look good. Keep your attached email images no larger than the screen by resizing them in style — online and free. Do not shout in your emails unless you mean to. Text set in all capital letters is construed as shouting and it is also difficult to read. No, really! I mean it. Honestly! A medium that offers little context such as email is not suited well to irony and sarcasm, even if you know the recipient. For important, formal emails or love letters, print the draft before you click Send. On a printed copy and with a pencil in hand, you can often find typos or misplaced commas neither you or your spelling checker caught. The job/relationship you save may be your own. Make sure you don't send messages from 1981 or 3078. When in Doubt, End Emails With "Thanks"
If you don't know how to say goodbye at the end of an email, there's one thing that will almost always be appropriate. Thanks. Without a line that says "sign here," how do you decide where to place your email signature? Place it right below the end of your text. Wondering "How to Put That in Writing?" Use "That"
Have you noticed how people who you understand perfectly well when you listen to them become cryptic and verbose when they start writing? Don't be like them. Tell it like it is and say it in the same way you would in a face-to-face conversation. Now is not the time to impress them with your mastery of the English language. Go for short and sweet. Small is beautiful, at least when it comes to email attachments. So make files smaller before you send them via email. "Me too" is not enough content to warrant an email. It is annoying. Wait until you have something to add to the conversation to reply. When Is the Right And Wrong Time to Hit 'Reply All'? Can You Write a Good Email Subject Line? What Does "EOM" Mean and How Can It Save You Time?